With his rigorous background in rhetoric and his tireless devotion to communication (in addition to his prolific painting) he was able to clearly articulate what American abstract expressionist painting was all about. Motherwell From the Studio, a summer exhibition at Knoedler & Company through June 28, 1991, presented a keen selection of works representing the best of his last years of production. In honor of Motherwell's uncommonly literate qualities, we created a unique icon out of his signature suggesting a watermark or wax seal that was used to authenticate the promotional campaign. 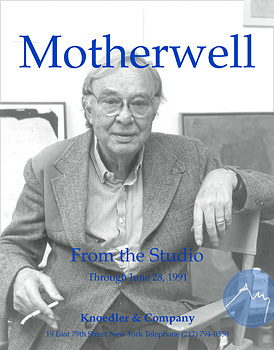 Knoedler's dictum was "we sell art not artists", but an exception was made for Motherwell, and we prominently featured throughout the campaign his portrait taken in the studio by his wife, the German photographer Renate Ponsold. But even the youngest member of the famed New York School must pass onMotherwell died July 16, 1991 at the age of 76, a month after the closing of the show.